They're coming to get you, Carl. The schedule-makers didn't do the Yankees any favors by having them open the season with road series at Boston and Tampa Bay. Not that it really matters — they opened 2009 against Baltimore and Kansas City, and managed only a .500 record — but the projected three-team fight for the AL East starts extra early this year. Things kick off tonight when Javier Vazquez officially returns to the mound for the Yankees for the first time since, you know, that thing that happened. 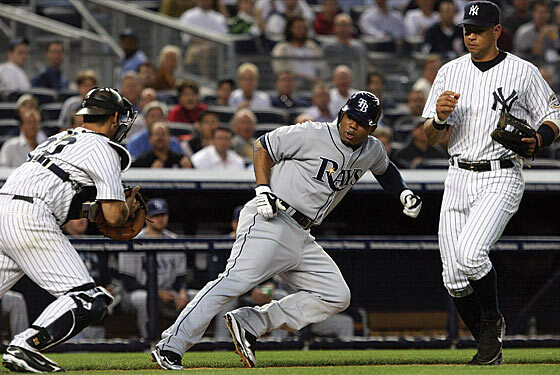 Some bad news for Javy: Future Yankee Rays left fielder Carl Crawford is 11 for 23 lifetime against him. The Yankees will start Vazquez, CC Sabathia, and A.J. Burnett against David Price, Wade Davis, and James Shields. Also worth keeping an eye on: Mark Teixeira, who went hitless against Boston to live up to his slow-starter reputation. (He's got a bit of history against Tampa, too: They plunked him intentionally last year, and also saw to it that he didn't surpass Carlos Pena for the league home-run title on the last weekend of the season.) If you haven't already, it's not too late to start your "When Will Mark Teixeira Start Hitting?" office pool. We've got April 29 in ours!